Oh man, I'm sorry I missed this one. John sent it to me in January, but it got lost amidst all the uBITX messages. I like it! It shows that I am not the only one guilty of re-purposing Benton Harbor Lunch Boxes. But what should we call it? It is now more Hyderabad than Benton Harbor. How about Hyderabox? That's it! You mentioned in your last podcast recycling "Benton Harbor Lunch Boxs". Many decades ago I talked my Junior High shop teacher into letting me build a Twoer instead of his lame project. Over the years 2 meter AM and the Twoer faded away. I recently revived a Lunchbox case for my uBitx. 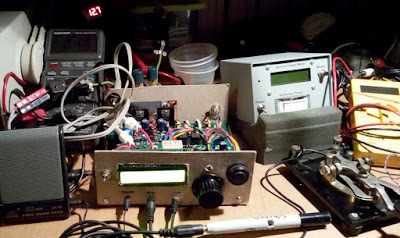 I added a Sotabeams CW filter that is controlled by the old T/R knob. Down the filter is bypassed, up one is wide CW and up two is narrow CW. The green pilot light light is a CW tuning indicator. I use KD8CEC's code which cleans up many small problems and adds a memory keyer and CAT control to the uBitx. I modded KD8CEC's code to remove the paddle sense segment so that it only works with a straight key. This makes the keying much cleaner. First contact with the modded uBitx was this morning. With 5 watts out I got a 599 from K3Y/7 (K7QBW) in Oregon back to me in Ohio. 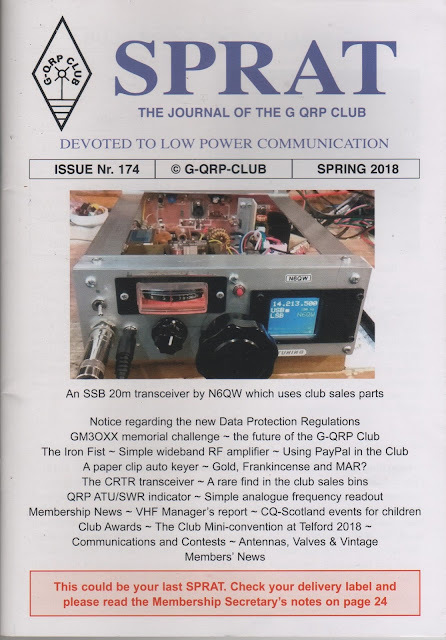 On Sunday night at 7 pm local on 7.277 MHz BITX users gather. This week was the debut of my uBITX. I was able to make only one contact before we were over-run by the Rookie Roundup, but that contact was a good one. Above you can see N1AW's FB uBITX. The front and back panels are made of cardboard. The mic holder is from a re-purposed Sharpie marker. FB Al. Thanks for the contact. Yesterday I decided to spend some time at the bench -- I wanted to get the uBITX boxed up. My basswood box had arrived from Amazon on Friday. It was time for what George Dobbs G3RJV called "socketry." First, the back. I figured I would need five connectors back there. Connectors for 12V DC, speaker, and antenna would be needed right away (it is my preference to have the speaker connector on the back of the BITX). Looking ahead, I might want to also have a jack for T/R control of my linear amplifier, and a jack for 24 VDC if I want to go wild and put more voltage on the drains of the IRF510s. So I put two extra holes in there. Basswood is SO easy to cut. I put the LCD in the center of the front panel, and opted to put the board close to the front of the board. This avoids the need for jumpers to connect the Raduino to the LCD, and it keeps the lines to the front panel controls and connectors very short. I mounted the board on the spacers that came with the BITX, drilling holes the bottom of the basswood box. It all fit quite nicely. I would need to put two jacks on the front panels: key jack and mic jack. And I'd need two controls: main tuning and AF gain. I used hole saws to cut holes big enough to accommodate the four items. The controls and jacks were then placed on two small pieces of copper clad board. These then went on the front panel. Wiring up the uBITX was easy. I just followed Farhan's instructions. I did the wiring AFTER placing the boards and controls in the box -- this helped me keep all the wires at their optimum length (not too long, and more important -- not too short!). If you do it this way, put a cloth over the boards so you don't drop solder blobs on the uBITX. Farhan's uBITX fired up nicely as soon as I applied power. The receiver really sounds nice. I hope to make some contacts with it today. 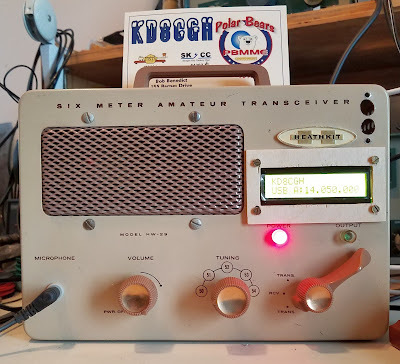 Our friend Rogier and I are involved in an East Coast -- West Coast uBITX launch project -- we plan to assemble our uBITXs together (more or less, via Skype) and then get them on the air. As has been my recent practice, I have opted to put my uBITX in the same kind of wooden box that I used for my three scratch-built BITX projects. See above. Now, due to Farhan's wizardry the uBITX is considerably smaller than the box. This is, of course, a good thing. It leaves room in the box for many bells and whistles. Should I put the uBITX board to the front of the box so that the LCD can be connected to the board DIRECTLY via the connector on the Raduino board (no jumpers needed), or should I put the uBITX board to the back of the box so that I can stick the PA heat sinks out the back? In the later case I'd have to use 4 inch jumper cables to connect the LCD to the Raduino. This use of jumpers seems to increase the possibility of noise from the display. What say the Knack Wizards? Back of the box with LCD jumpers, or front of the box with no jumpers but heat sinks inside the box? AMAZING 1999 Video on the Invention of the Transistor at "Hell's Bells Laboratory"
Thanks to Armand WA1UQO for alerting me to this. I really liked the book -- "Crystal Fire" -- that this 1999 video is loosely based on. I'm also a fan of the narrator, Ira Flatow, whose melodious voice is heard each week on NPR's excellent "Science Friday" radio show. -- I liked the irreverant Calypso song "Hell's Bells Laboratory." It looks like those folks had a lot of fun. And wow, Shockly's secretary was named Betty Sparks. TRGHS. -- I have the same big Variac on my bench. And I have one of those "third hand" devices. -- I'd like to build my own replica of the point contact device with the triangular piece of lucite and the gold foil. -- While Shockley seems to be the real bad guy in this story (he seems to have all the bad characteristics of David Sarnoff, Lee DeForest, and Steve Jobs), I liked the his use of "physical intuition" to understand devices and the problems they were meant to solve. -- The image of the two Japanese founders of Sony working in the late 1940's in a bombed out department store was very powerful. -- Although I came on the scence a bit later, I WAS one of those kids who used a transistor radio and an earphone to surreptitiously listen to rock-and-roll music. Back when some us were thinking of new names for the podcast, Steve, N8NM thought of Purple Haze by Jimi Hendrix and came up with this set of lyrics (listen to the video above to get the tune). Making rigs, some don't work that great. Kill some birds for that Legba guy. Don't if I should turn the bias down. Oh, it's a FET, that would make it Vdd. Come tomorrow, I won't be to work on time. Pete, WB9FLW took a more, well, defiant line. He came up with new name for the podcast that sort of captures the shocking level of indignation that this completly bogus story generated. Pete suggests that we simply call the new show: "FLUX YOU"
Thank you gentlemen. You are both, in a way, poets. And Hendrix would, I think, approve. Now, will the Wizard of Newbury Park pull out his guitar and get to work on this? First, let me thank the many, many MANY, loyal listeners from around the world who wrote in with expressions of support and sympathy. Special thanks to our UK listeners who were notable in their indignation for they saw as a blatant example of US litigiousness "gone mad." One loyal British listener went so far as to pledge to immediately end his patronage of the Birmingham Vaping business known as SodderSmoke. We found this quite, well, suprising. But we were chuffed, nonetheless. Thanks OM! The expressions of concern were really quite touching. One listener asked if he should -- in an effort to keep us out of hot water -- destroy his SolderSmoke coffee mug. With fans like that, well, what can I say? In responding to the legal crisis, our listeners displayed ASTOUNDING creativity in their crafting of alternative names for the podcast. Gary suggested SolderSuckers. I briefly thought of the many people who wrote in (see above) but concluded that that one just sucked. No. A number of listeners suggested legal counterattacks and fund-raising effots. (We did get one unsolicited donation!) One fellow suggested fighting fire with fire by having us trademark the phrase "Chicks dig it" and then just letting the money roll in. There were, unfortunately, many disparaging comments about California, and "pot-heads," and "California pot heads." But hey, Dudes... they don't mind. They are not going to let you harsh their mellows. Stewart tried to claim that there is some sort of UK rule that says that things like this can't be carried on past noon local time in Britain. Ha! I said. We are no longer bound by Imperial edicts. Similarly, Peter in Australia complained that the story reached him on April 2, rendering it null and void. Sorry Peter, these are UTC operations my friend. Time to wake up and join the rest of the world! Well, let me get to the point: The beloved name of our podcast and blog has been saved by a loophole. You see, any legal challenges of this nature launched and announced on April 1st of each year are HIGHLY likely to be found, on even casual examination, to be be null, void, and totally bogus. -- PETE'S COMPUTER WAS NOT SEIZED BY A COURT ORDER. -- THE CALIFORNIA MARIJUANA INDUSTRY IS NOT PLANNING ON MARKETING SOLDER-SCENTED WEED. -- WE ARE NOT BEING SUED FOR TRADEMARK VIOLATION BY AN EVIL MARIJUANA-VAPING JUGGERNAUT. We mentioned on the last podcast that we had some difficulties that led to a long delay between Podcast #202 and #203. We couldn't go into detail, and we are still somewhat limited as to what we can say, but we thought that today we should bring you all as up-to-speed as we can with what has been going on. First, an apology. Some of what we told you was, in retrospect, kind of misleading. Pete's computer didn't really crash. Sure, he did have to reconstruct a lot of files, but his original computer was just fine. The problem was that it had been taken by court order as part of the legal mess we find ourselves in. Here is the deal: We got hit with a "violation of trademark" lawsuit. It seems that one of the new agricultural industries that has sprung up recently in California has taken a very aggressive legal stance in protecting their "rights." Part of this effort is a proactive filing for trademark protection for any product name that could in the future be related to their product. So apparently anything with "smoke" in the name was scooped up by them. They also claim to forsee the possibility of a "solder-scented recreational product." We also suspect they are in cohoots with the new electronic cigarette "vaping" industry. We have heard that they are working with a "vaping" company in Birmingham, England that calls itself "SodderSmoke." (As you may have heard, the word has a different connotation in the UK.) They are using this British Vaping thing to bolster their claim that we are violating their trademark. Pete feels terrible about all of this. The fact that he is located in California was what allowed the LA lawyers to take us to court in that state. And we have been advised that we do not have much of a chance in this matter. You see, marijuana has become a very important product in Pete's state. And "vaping" with e-cigarettes is also very big out there. So there is big money and big cultural forces behind this effort. We a tiny small fish caught in the net of big new industries. Pete wants to fight this (you know how he is) but I think we will have to just give in and move on. Look, STARTING TODAY they are threatening to sue us for ONE MILLION DOLLARS every instance in which we use name of the podcast that you have all come to love so much. I am scrambling to expunge the title from all the blog files. Just look at the header on the top of this blog page.